My sister Karen has several fruit trees in her yard that produce far more fruit than she and her husband can possibly eat. She came to the same decision that I made with my marmalade that she could make Christmas gifts with them. This year she sent us apple butter. When I proposed my usual Greek lamb for this Easter’s dinner, I was faced with a bit of a revolt. We finally settled on both ham and salmon as the main dishes. For everyday meals, I usually broil my ham steaks, but—since I was already planning to plank grill the salmon—grilling it this time was an easy decision. When Safeway has a half price sale on hams (after a holiday) I buy a half a ham and cut it into ¾ inch ham steaks to freeze for later. 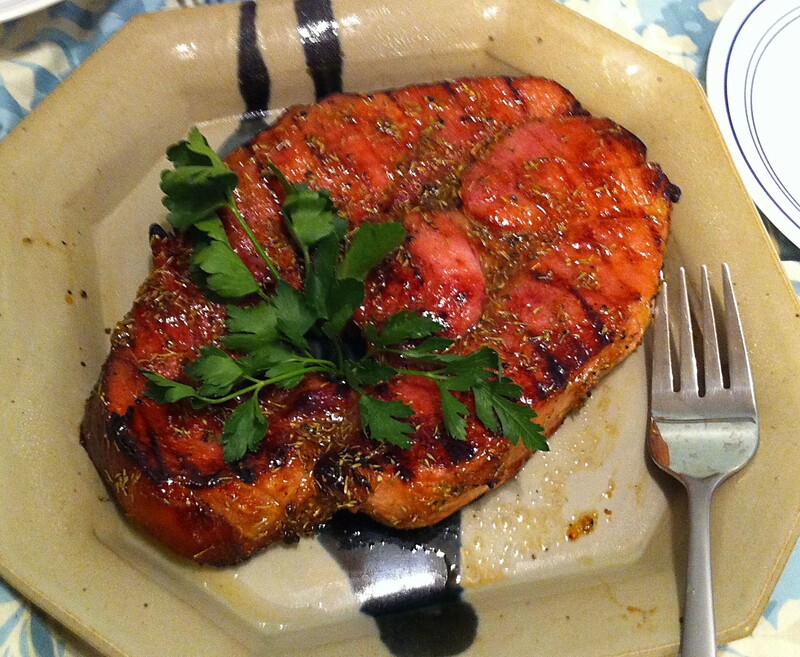 A ham steak is pretty much just a slab of meat. The trick is what glaze do you put on it to dress it up. Many weeks I will spend the entire week thinking about and planning Sunday’s dinner. I have had a rough week—broken car, broken shower, broken refrigerator—and I did not feel I had it in me to plan an elaborate meal ahead of time. A plain ham steak, steamed green beans, a simple coleslaw, and a baked sweet potato would have to do. While this is a meal that started off simply, I got carried away. When Safeway has a half price sale on hams (after a holiday) I buy a half a ham and cut it into ¾ inch ham steaks to freeze for later. A ham steak is pretty much just a slab of meat. The trick is what glaze do you put on it to dress it up. I have been experimenting with ways to use my marmalades—in other ways than just slathering it on toast and pancakes in the morning. When Safeway has a half price sale on hams (after a holiday) I buy a half a ham and cut it into ¾ inch ham steaks to freeze for later. 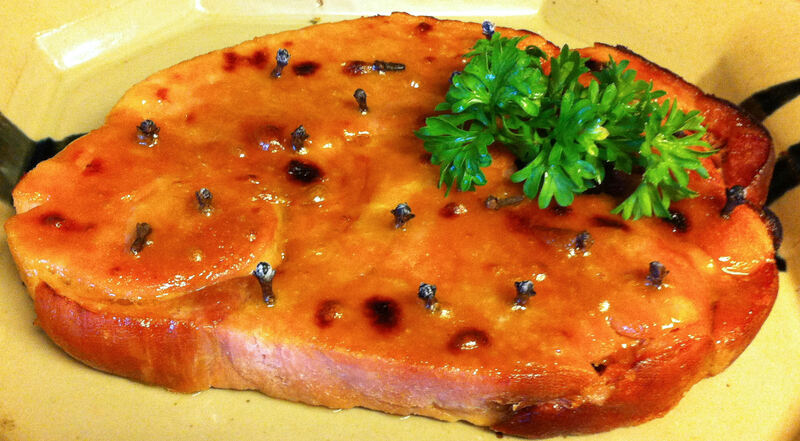 While ham steak is good just on its own, it is nice to dress it up a bit. For this Sunday’s dinner, I thought I would try to barbecue the steak and put a lemon glaze on it. Today, as I was thinking about making a ham steak, I was wondering what I could do that was new and different from the usual brown sugar, vinegar and clove glaze. I have settled on Asian coleslaw for my salad and a sweet potato and peanut soup as my starch. I also planned orange marmalade custard for desert. This is a bit unusual for me. 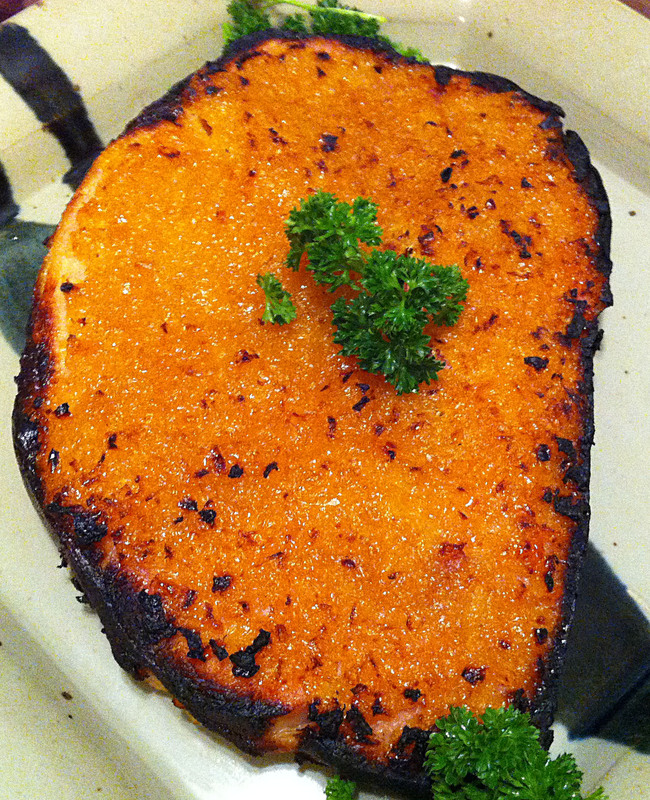 Normally, I decide on what I will do with the main dish and that will lead me to my side dishes. 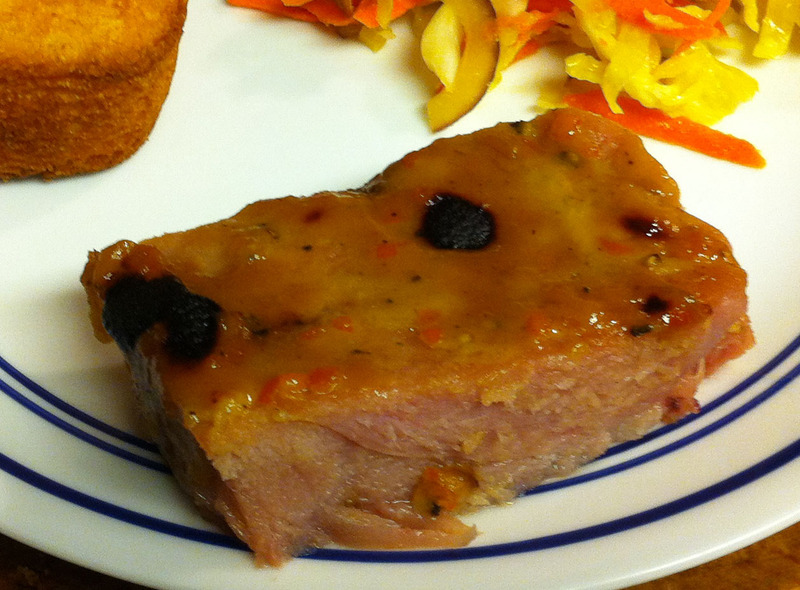 Today, as I was thinking about making a ham steak, I was wondering what I could do that was new and different from my usual brown sugar, vinegar and clove glaze. I made a Caribbean salad last Sunday and I was thinking that a variation of that dressing might work well. Jan thought the using a whole Habanero was a bit too spicy, but go with your own tolerance. When Safeway has a half price sale on hams (after a holiday) I buy a half a ham and cut it into ¾ inch ham steaks to freeze for later. This is later. The French girl is still with us and I decided to make ham steak, parsley potatoes and coleslaw for dinner.